We consider the service system design problem with congestion. This problem arises in a number of practical applications in the literature and is concerned with determining the location of service centers, the capacity level of each service center, and the assignment of customers to the facilities so that the customers demands are satisfied at total minimum cost. We present seven mixed-integer second-order cone optimization formulations for this problem, and compare their computational performances between them, and with the performance of other exact methods in the literature. Our results show that the conic formulations are competitive and may outperform the current leading exact methods. One advantage of the conic approach is the possibility of using off-the-shelf state-of-the-art solvers directly. 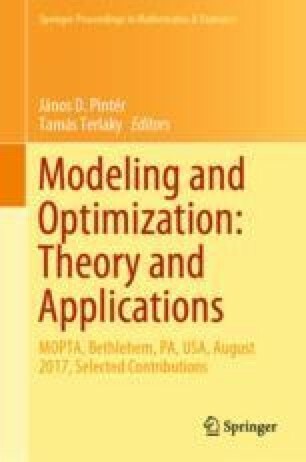 More broadly, this study provides insights about different conic modeling approaches and the significant impact of the choice of approach on the efficiency of the resulting model. The first author acknowledges the support of the 2013 GERAD Postdoctoral Scholarship for the development of this research. This work was supported by the Canada Research Chair in Discrete Nonlinear Optimization in Engineering.